The debate over profiling airline passengers revived after the thwarted Islamist plot to bomb 10 airplanes in London on Aug. 10. The sad fact is, through inertia, denial, cowardice, and political correctness, Western airport security services — with the notable exception of Israel's — search primarily for the implements of terrorism, while largely ignoring passengers. Although there has been some progress since the attacks of September 11, 2001, most involves the scrutiny of all travelers' actions. For example, in 2003, the Transportation Security Administration, charged with protecting American airplanes, launched a passenger profiling system known as Screening of Passengers by Observation Techniques, or SPOT, now operating in twelve U.S. airports. Adopting techniques used by the U.S. Customs Service and by Israeli airport security, SPOT is "the antidote to racial profiling," TSA spokeswoman Ann Davis, said. It discerns, she said, "extremely high levels of stress, fear and deception" through "behavioral pattern recognition." SPOT agents observe passengers moving about the airport, with TSA agents looking for such physical symptoms as sweating, rigid posture, and clenched fists. A screener then engages "selectees" in conversation and asks unexpected questions, looking at body language for signs of unnatural responses. Most selectees are immediately released, but about one-fifth are interviewed by the police. After the London plot, the British authorities instituted a crash-course in SPOT, learning directly from their American counterparts. Building on this approach, an Israeli machine, called Cogito, uses algorithms, artificial-intelligence software, and polygraph principles to discern passengers with "hostile intent." In trial runs with control groups, the machine incorrectly fingered 8% of innocent travelers as potential threats and let 15% of the role-acting terrorists slip through. While methods that target the whole population have general value — SPOT did discover passengers with forged visas, fake IDs, stolen airline tickets, and various forms of contraband — its utility for counterterrorism is dubious. Terrorists trained to answer questions convincingly, avoid sweating, and control stress should easily be able to evade the system. The airport disruptions following the thwarted London plot prompted much discussion about the need to focus on the source of Islamist terrorism and to profile Muslims. In the words of a Wall Street Journal editorial, "a return to any kind of normalcy in travel is going to require that airport security do a better job of separating high-risk passengers from unlikely threats." This argument is gaining momentum. A recent poll found that 55% of Britons support passenger profiling that takes into account "background or appearance," with only 29% against. Lord Stevens, the former chief of Scotland Yard, has endorsed focusing on young Muslim men. The Guardian reports that "some EU countries, particularly France and the Netherlands, want to … introduce explicit checks on Muslim travelers." One politician in Wisconsin and two in New York State came out in favor of similar profiling. A Fox News anchor, Bill O'Reilly, has suggested that Muslim passengers ages 16 to 45 "all should be spoken with." Mike Gallagher, one of the most popular American radio talk-show hosts, has said he wants "a Muslim-only [passenger] line" at airports. In a column for the Evening Bulletin, Robert Sandler proposed putting "Muslims on one plane and put the rest of us on a different one." The British Department for Transport reportedly is seeking to introduce passenger profiling that includes taking religious background into account. 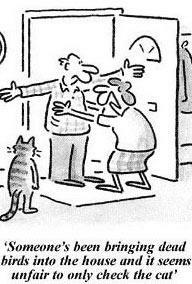 News from British airports indicates that this has already begun – sometimes even by fellow passengers. Three conclusions emerge from this discussion. First, because Islamist terrorists are all Muslims, there does need to be a focus on Muslims. Second, such notions as "Muslim-only lines" at airports are infeasible; rather, intelligence must drive efforts to root out Muslims with an Islamist agenda. Third, the chances of Muslim-focused profiling being widely implemented remain negligible. As the same Wall Street Journal editorial notes, "the fact that we may have come within a whisker of losing 3,000 lives over the Atlantic still isn't preventing political correctness from getting in the way of smarter security." Noting the limited impact that losing 3,000 lives had in 2001 and building on my "education by murder" hypothesis — that people wake up to the problem of radical Islam only when blood is flowing in the streets — I predict that effective profiling will only come into effect when many more Western lives, say 100,000, have been lost. "It is a fact that over the past 34 years, starting with the Munich Olympics, the majority of terrorist attacks have been carried out by Muslims," said Mark Flanagan, a candidate in the 13th District of Florida, in a statement released this morning. ... David Johnson, Flanagan's political consultant, said that under the proposal, passengers who appear to be Arab or Muslim would be pulled out of security lines for additional screening. In an interview, Flanagan declined to say how screeners would determine which passengers met that description, or whether black Muslim and Christian Arab passengers also should be subject to heightened security measures. "Those questions are premature, albeit very important." Aug. 24, 2005 update: Are the U.S. authorities inching toward profiling? Customs and Border Protection issued a statement indicating it "does not use racial profiling, however CBP officers may scrutinise more closely individuals arriving from high-risk countries." 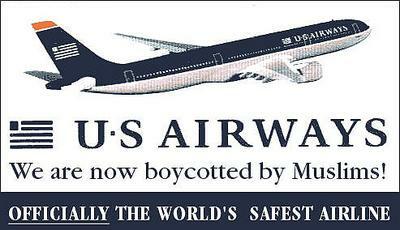 Dec. 8, 2006 update: After an incident when six imams were removed from US Airways plane on account of their suspicious activities, rumors spread of a planned Muslim boycott of US Airways, which in turn spawned the following mock US Airways adverstisement.